Often, when we talk about getting the most from your SEO strategy, we discuss having anchor text leading to specific pages in your website. This, of course, makes sense. Anchor text attracts people to a specific purpose, so it makes sense to link to the page that meets that need. However, you shouldn’t forget your landing pages so easily. This is especially true of the home page. For a start, there are still people who will find your website through organic means, so the home page will always be relevant. Likewise, these pages still hold plenty of potential in their own right. The landing page should, in essence, surmise what your website is about. If you’re a clothing shop, this should be clear from the very first page. The home page should make it clear what your products, service or even themes are. So, yes, by all means optimise your home page for SEO. The best method is to choose a broad, generic keyword, such as “clothing”, “online clothes” and other catch-all terms. More specific terms, especially longtail keywords, belong on more specific pages, as they represent more specific search queries. 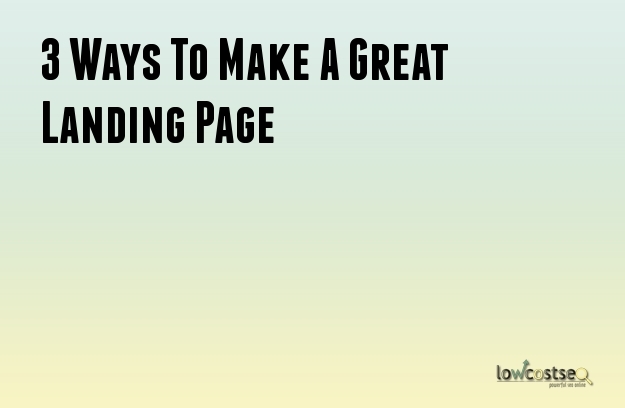 Even if you draw people into a specific page further down the tree, there’s always a chance that people will end up on a home page or similar landing page. After all, if you link people to your jackets and, after having a positive experience, they wish to look at your wider products, it makes sense for them to click to a category page (if they have one in mind) or a broad landing page. If these pages aren’t at their very best, you could risk losing the very customers you’ve just made. At the very least, you could put them off spending more time on your site and making a bigger commitment or investment with your brand. The solution? Ensure your main page has some great navigational tools, showcasing what you have. It should also ensure users can get to deeper pages in as few clicks as possible. In journalism and, indeed, online copywriting, the inverted pyramid is a key principle. In short, you introduce the broader topic, only going into details later on. This means readers understand the basic story (a man did a thing) and get the further details (who? What? When? Why?) further down. Why is this important? It gets people hooked with a basic understanding before giving them the more complex data. Your website should be the exact same! Your landing pages do not need to overload people with information. If you sell something, this should be clear from the images and short text on screen. Once people understand this, they can then look for further specifics in the category pages. This also helps with navigation, but it ensures that you don’t make your landing pages too busy or crowded as well. Ultimately, great landing pages aren’t hard to achieve. What’s most important is that you don’t forget about them!